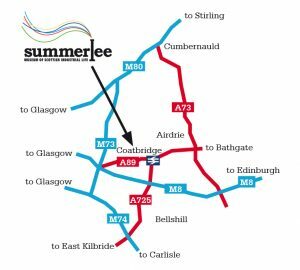 Summerlee welcomes you to its 20 acre site with free parking, free admission and all-weather facilities. It all adds up to a belter of a family day out! Situated in Coatbridge, an important centre within Scotland’s ‘industrial heartland’, Summerlee Museum of Scottish Industrial Life is built on the site of the old Summerlee Ironworks, and incorporated the main workshop of the former Hydrocon Crane factory. Click here for more information about the history of Summerlee Museum. Summerlee received a £10 million redevelopment in 2008, and today the museum is a modern and thriving visitor attraction. Rated a four star attraction by Visit Scotland, it’s the perfect setting for an unforgettable family day out. From our amazing array of social history and interactive displays to our award-winning play park – there’s so much to see and do. Take a ride on the tram, experience the mine tour and miners’ row, refuel at the café and take home a lasting memory from our visitor shop. Why not explore the site in a unique way by downloading the Global Treasure app before you visit? Use the app to find clues, collect rewards and learn loads! Click here to download for free. No dogs (except assistance dogs) are permitted on site. Please do not cycle within the museum grounds. Use of bike racks is at owner’s own risk. Want to have your birthday party at Summerlee? Click here for more information! Interested in hiring our conference room? Click here for more information.